When drafting a foundation pattern for the human figure, it is not only important to take the necessary measurements, but also to take them correctly. 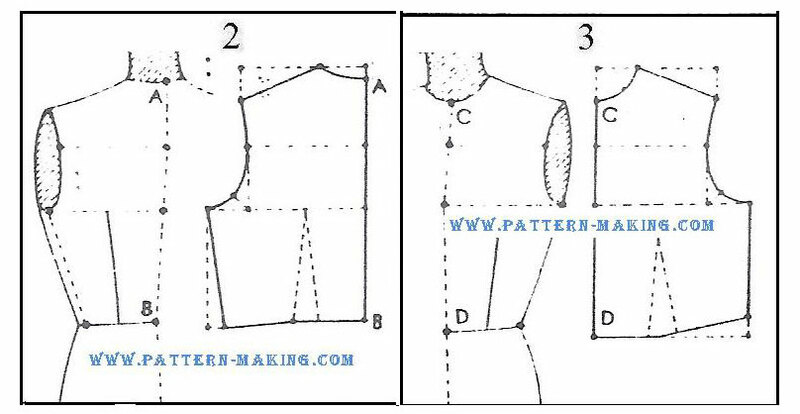 For best results, students should first practice taking measurements, of the dress form (for drafting purposes) before taking measurements of the human figure. First have the person wear a plain dress or blouse, with a high neckline, regular armhole, and plain set- in-sleeve ; then arrange a tape or thin cord around bust and waistline rather closely, as illustrated. 1 – Center back at neck. 2 – Center back at waistline. 3 – Shoulder seam at armhole. 4 – Shoulder seam at neck. 5 – Side seam at armhole. 6 – Side seam at waistline. model measures 34” around bust, but after taking a deep breath she will measure between 36” to 36-1/2”. All dress forms have the chest expansion allowance. Therefore the fitted waist pattern should include the chest expansion allowance or else the side seams will tend to rip. WAISTLINE – According to the present style trend, the waistline slopes at a slight angle, making the waistline 1/2” lower at center front, and 1/4” lower at side seam than at center back, as indicated at points A, B and C.
NECK – The posture of the figure brings the back of neck, point D, about 2” higher than front of neck point E, (measuring from the floor level). ARMHOLE DEPTH – Point F at armhole is located about 1” below the armpit of the human figure. This applies to a dress with or without sleeves. SHOULDER SLOPE – The normal slope of the shoulder brings the point at armhole about 2” lower than at neck. WAIST DARTS – The darts in front and back give the garment a smooth and close fit at the waistline. 1) Diagram shows important construction lines in the draft of the back. It demonstrates the use of the square in miniature forms. When drafting the back, the first line to be drawn is the center back line. This serves as the backbone of the draft just as the center back is the backbone of the figure. All other points in the draft must be located by ruling squared lines with great precision. Mark a noticeable dot at the end of each drawn line. 2 and 3) These diagrams shows separate relative positions between the figure and the pattern of the back and front sections. For the normal figure, only half of the pattern I needed, (from center back to center front). 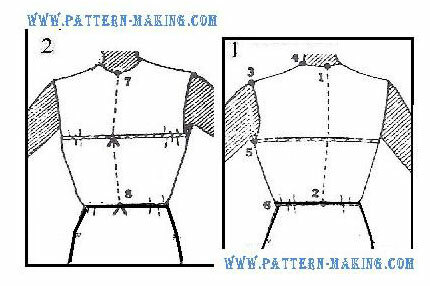 For a noticeable difference between the left and right side of the figure, an entire front and back back pattern is required.